Although Scottish Stained Glass designs glass in every style imaginable we give Frank Lloyd Wright his own page in part to pay homage to his genius which has inspired thousands of architects and designers over the years and also because his designs retain a popularity today which is unwavering with the passage of time and if anything his style is even growing in popularity. Frank Lloyd Wright`s importance to stained glass cannot be over emphasized. He designed more than 4,000 stained glass panels, which he called `Light Screens` in over 150 of the buildings he designed. He was born in 1867 and died in 1959 and has been named “The Greatest American Architect of all Time” by the American Institute of Architects. Frank Lloyd Wright`s Prairie Style of designs are very appropriate for some of our homes here in San Antonio whereas many of our other clients, even living in more traditional homes, will find a place for an FLW unpriced creation just because his style is so well loved. At Scottish Stained Glass we don`t copy his designs but as you can see from some of our work on this page we are very much inspired by it. Most of the photos here are Scottish Stained Glass work and one or two of the pictures are originals. For those of you somewhat familiar with his work our favorite FLW homes where we have drawn inspiration from are The Willits House, The Robie House, The Martin complex, The Dana House, Fallingwater and the Coonley Playhouse. Most of the Frank Lloyd Wright stained glass designs have predominantly clear glass with small pieces of color. The exception to this would be the ceiling panels or any back lit panels which are usually all color. Some of our clients prefer to keep this authentic look while others prefer to substitute the clear glass for a glass with more texture to help with privacy issues. Our free consultation service is available to everyone. 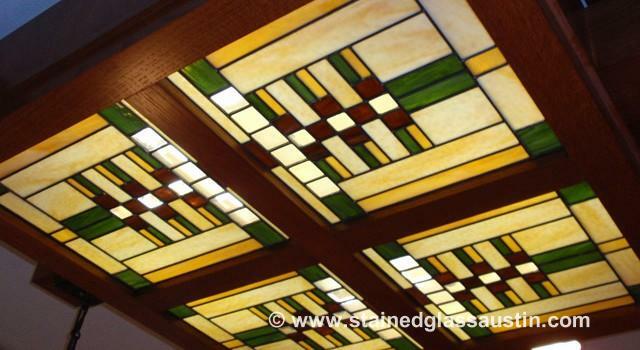 Whether you are remodeling an existing home or just in the planning stages for a new construction project Scottish Stained Glass can help you design the perfect Frank Lloyd Wright stained glass artwork for your home.